After a long fight, which started in 1919, Tipton became a Municipal Borough on 1st October 1938. 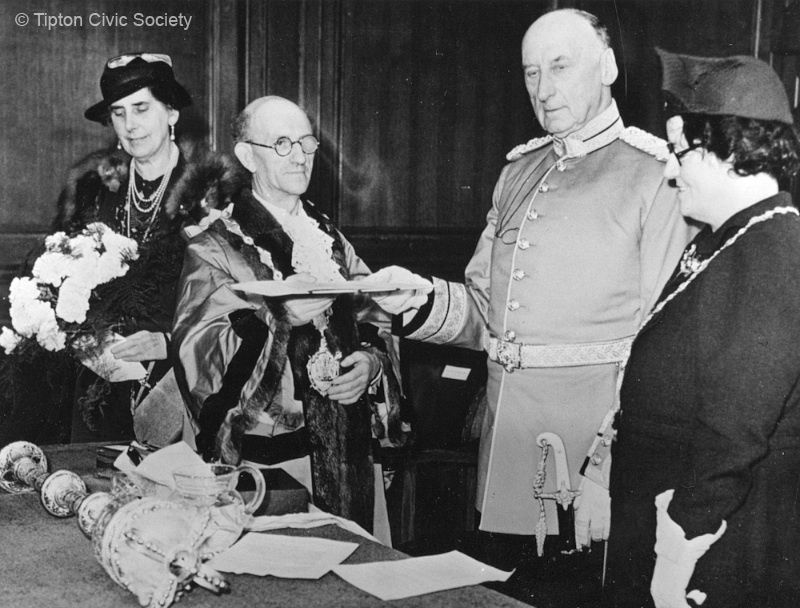 The photograph shows the Charter of Incorporation being presented to the Charter Mayor, Councillor A F Welch, by the Rt Hon the Earl of Harrowby, Lord Lieutenant of the County of Stafford, on that date in the Municipal Buildings. On the left is the Countess of Harrowby and on the right the Charter Mayoress, Mrs M Welch. The Deputy Charter Mayor and Mayoress were Councillor and Mrs W J W George. Officials of the council at the time of the Incorporation Inquiry were: K W Madin (Solicitor and Town Clerk), W B Tranter (Assistant Town Clerk), H N Woodward (Engineer and Surveyor), R Pilling (Treasurer), A Hastilow (Director of Education), W Williams (Gas Engineer and Manager), G H Acton (Sanitary Inspector), H Scriven (Housing Manager), C. R. Gallie (Housing Director), and A M Taylor (Librarian). Members of the Tipton Urban District Council at the time of the Charter were A F Welch JP, S Davis JP, A Parker JP CC, J E Tommas, W G Gibbs, R A Hancock, W A Whitehouse, W J W George, C W Grove, F Sneyd, A E Bolton CC, J Hemmings, W S Hill, Mrs L Bagnall, W J Rhodes, W E Hampton, A Jones CC, A Naylor, A E Bannister JP, F Neale, J Warner, T Darby, G M Kennedy and J E Salter. 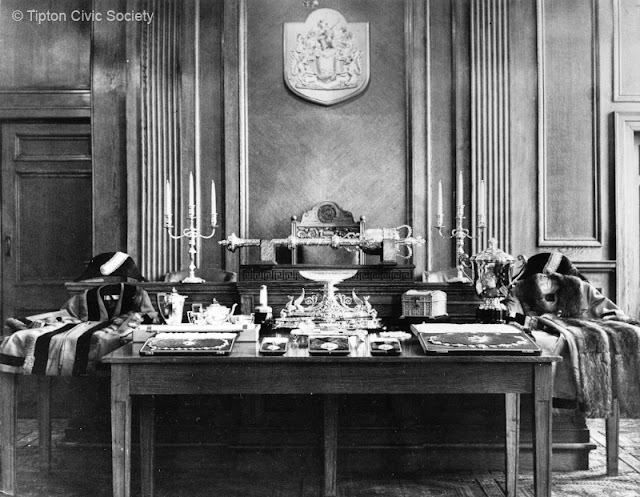 The Civic Regalia, which cost almost £1000, was paid for by a group of Tipton Industrialists and was presented to the Charter Mayor, Councillor A F Welch, at a special dinner at the Midland Electric Company Pavilion at Toll End on 22nd September 1938. The photograph shows the full regalia laid out in the Council Chamber. The Tipton Herald of 24th September 1938 carried the following descriptions of the individual pieces. The MACE, which is large and massive, is designed in the early English period. The body of the Head is divided into four panels, the front bearing the Borough Arms and the reverse side the Royal Coat of Arms. The remaining panels contain raised shields with GR VI and the year 1938 respectively. The whole is surrounded by a raised design of the English Rose and Oak. The Oak leaves and Acorns represent fortitude (strength) for generations to come and the Rose, England. The Head is surmounted by an open Imperial Crown at the top of which are the Orb and Cross (an emblem of Power and Sovereignty). This is supported by four finely modelled and chased brackets terminating in miniature busts of Britannia. The Shaft is decorated with a raised design of the Rose and Oak, whilst along its entire length a ribbon is intertwined, interrupted by two richly chased knots. At the bottom of the Shaft is a very large and handsomely chased foot knop. The Mace is of massive silver and richly gilt. The MAYORAL CHAIN AND BADGE is very handsome in design and workmanship. The Badge is hand wrought and the whole 18ct gold. The Borough Arms with crest, supporters and motto are raised and are in full heraldic colours. Surrounding this in a shield formation is a border of intertwining acanthus leaves which hold a Sword and a Mace diagonally across the Badge. Surmounted at the top is the Imperial Crown out of which a Thunderbolt (the symbol of electricity) forms a decorative loop. The Chain is composed of eleven large links with a raised Roman “T” to represent Tipton and twelve smaller links of geometrical formation. The large centre links bear a raised Lion rampant on a shield. The MAYORESS'S CHAIN AND BADGE is very pleasing in design, taking the shape of a geometrical pattern which is formed round the Borough Arms with crest and supporters. The Arms which form the chief feature are hand wrought and in full heraldic colours. At the top is a decorative clasp which connects with the centre link of the chain and at the bottom is a Rose in enamel with a spray of leaves. The Chain is an exact replica of the Mayor’s Chain but reduced half size. The Chain and Badge are 18ct gold. The MAYOR'S OCCASIONAL BADGE is large and handsome and takes the form of a geometrical pattern, the Borough Arms with crest, supporters and motto raised in full heraldic colours being the chief feature. At the top is a decorative clasp to which is attached a ribbon. The DEPUTY MAYOR'S BADGE is similar in design to the Mayor's Occasional Badge only smaller in size. The DEPUTY MAYORESS'S BADGE is a replica of the Deputy Mayor's Badge but smaller in size. SILVER, EBONY AND IVORY GAVEL. SILVER GILT LOVING CUP, engraved with Borough Arms. SILVER TEA SET AND TRAY, engraved with Borough Arms. SILVER CASKET, with engrossed record of subscribers and presentation. The members of the teaching profession and scholars of the local Schools also displayed their enthusiasm in a generous and public spirited manner by presenting for the Council Chamber a replica of the BOROUGH ARMS in raised bronze in full heraldic colours and mounted on an oak shield (this is now on display at the Tipton Community Museum in Tipton Library). All the above mentioned articles were designed and executed by Mr W F Wilson, Goldsmith and Silversmith, Oldbury Road, Smethwick. The MAYORAL ROBES were presented by the Charter Mayor, Councillor A P Welch JP, and the Deputy Mayor's Robes were the gift of the Charter Mayoress, Mrs A P Welch. ARMS – Gules a castle between in chief three wheels and in base a Stafford knot or. CREST – On a wreath of the colours issuant from a rock three spear heads proper hafted or. SUPPORTERS – On either side a lion or pendent from the mouth by a strap gules an escutcheon sable charged with a tunderbolt gold. 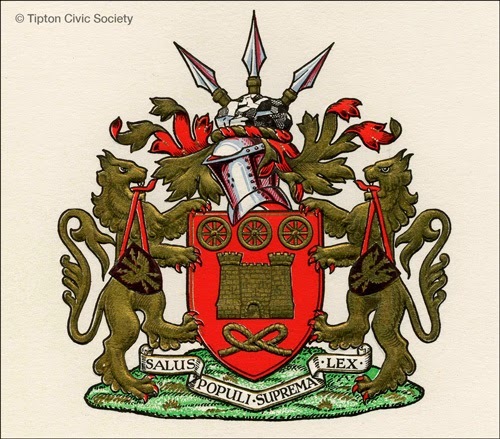 MOTTO - “Salus populi suprema lex” meaning “The supreme law is the welfare of the people”. Only one woman held the office of Mayor of Tipton – Mrs H G Cox. Two men were honoured with the Freedom of the Borough – A E Bolton and J E Salter, both stalwart members of the Borough Council. Following the amalgamation of Tipton and Wednesbury with West Bromwich in 1966 the civic regalia from both former boroughs was put on display in West Bromwich town hall. However, in September 1981 the Tipton Mayor’s and Mayoress’s chains together with the Wednesbury Mayoral chain were stolen in a burglary and never recovered. All of the civic regalia relating to the six towns of Sandwell are now kept in the Sandwell Mayor’s parlour in the Big House in Oldbury adjacent to Sandwell Council House. The Tipton regalia does make the occasional outing back to its home town, one such example being on 27th April 2010 when Barry Whitehouse gave a talk in Tipton Library about his father Jonah Whitehouse who was Tipton’s last Mayor. 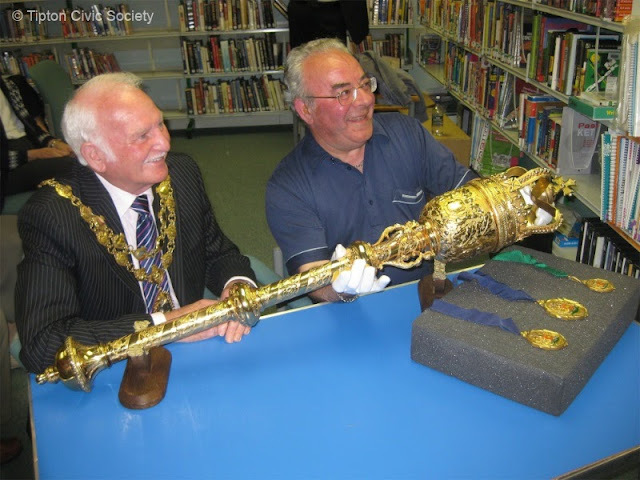 He is pictured with Sandwell’s Mayor, Councillor Geoff Lewis, holding the Tipton mace. Also displayed are the Mayor’s occasional badge, the Deputy Mayor’s badge and the Deputy Mayoress’s badge.